Eat Dallas: Drive-in me crazy! I practically lived at the Gemini, at Forest Lane and Central Expressway (I-75), during high school. I mean, what can beat stuffing your friends into the trunk of the 70' Chevy Impala (with a case of cold beer), yelling at them to "Shut-Up!" when you got close to the entrance, and then waiting to let them out until they're really good and pissed at you. The agenda? Drinking beer, throwing some Frisbee, kicking the hacky-sack around, and scopin' out chicks! What movie was showing was of no consequence; you just always went to the center screen. That's where the cool people hung out. 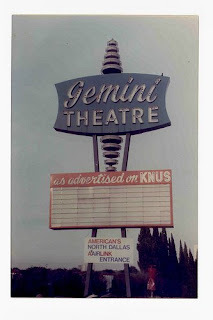 The only pics I could find of the old Gemini Drive-In on I-75, in Dallas. The demise of the drive-in in Texas, once a bastion for this type theatres, was a slow but steady inevitability. As the property value of suburban sprawl increased, the demand for these large tracts of land outweighed their earning potential and car dealerships and fast food joints soon won out. In July of 1934, the third drive-in theatre in the United States opened in Galveston, Texas and by the mid-50s, there were over 400 of them in the Lone Star State. Holding onto the tradition in true Texas fashion, there were still over 200 well into the 70s. Unfortunately, that number has dwindled to only 18 theatres in the state now. On a high note, 7 of these have been built in the last five years, giving hope to all of us al fresco movie aficionados. 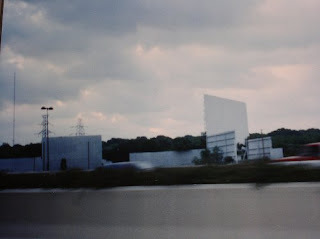 For a list of many of these theatres check out http://www.driveinmovie.com/TX.htm. 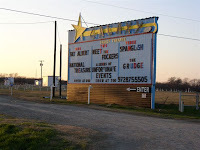 Now, the closest drive-in to Dallas is the Galaxy Drive-In in Garrett, Texas, on I-45, just north of Ennis at exit 255. From Dallas, go 20.5 miles south of the I-20 & I-45 interchange, and at exit 255 for FM 879. They are open seven nights a week and they always show two features for the price of one. They even have a miniature golf course, complete with neon palm trees! Tickets are only $6.00 for adults and $2.00 for children from 5 to 11 years old. Their web site is http://www.galaxydriveintheatre.com/. You can call 972-875-5505 for more information. With cover prices so low, drive-ins really make their money from snack bar sales. Consequently, no outside food or drinks are allowed into the theatre. But, the Galaxy has a very reasonable snack bar with loaded cheeseburgers going for only $2.75, State Fair Corn Dogs and hot dogs for $1.25, Nachos starting at $2.75, and Pizzas for $4.25. Drinks are $1.25 to $2.50. So, pack up the kids, friends, wives, or girlfriends and head out to the drive-in! Lets keep these venues open and thriving as an alternative to the $50 night at the local multi-plex. This would be so lovely on an early fall evening when there is just a hint of the coolness to come. It would be a great group activity... we all need to talk and make it happen!